Here are several photographs of violinist Teresa Cuevas. She was born on April 20, 1920, in Topeka, Kansas. She formed the first all-female mariachi band in the United States, named Mariachi Estrella. 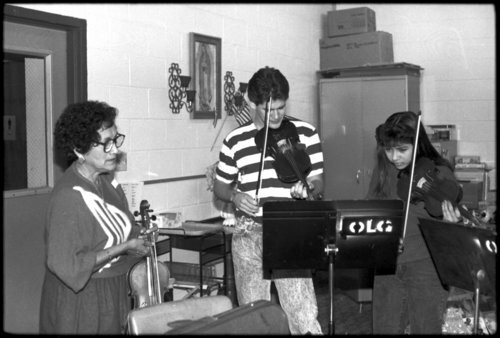 The original members included Connie Alcala, Delores Galvan, Teresa Cuevas, Rachel Galvan, and Linda Scurlock. The black and white photographs were taken during the Folk Arts Apprenticeship Program, developed in the 1980s by the Kansas Historical Society and the Kansas Arts Commission with funding by the National Endowment for the Arts. The color photographs were taken at the 1986 Kansas Folklife Festival and a 1989 folk art exhibit opening at the Kansas capitol building in Topeka, Kansas. Tereas Cuevas passed away on December 12, 2013.